Home > Shop > Books > Clean & Hungry OBSESSED! 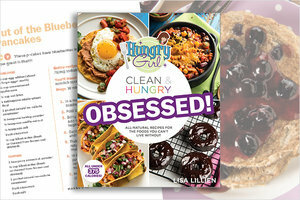 Healthy, all-natural recipes for the foods you crave... All under 375 calories! The first Clean & Hungry cookbook introduced people to Hungry Girl’s style of clean eating with simple, fresh, and fantastic meals and snacks. But people were hungry for more! It was time to re-create the beloved comfort foods that Americans are OBSESSED with. French toast, lasagna, fried chicken, quesadillas, fudge . . . No food is off-limits! Freestyle™ Smartpoints® values* available here.